One common threat all homes with basements face, no matter their location, is a basement flood. Whether the cause is back up sewage, broken pipes, a pump that goes on the fritz, rain, every home’s basement has at least a slim threat it will end up with at least a significant leak if not an all-out flood. If you are trying to avoid needing emergency water removal in Alpharetta, here are the chief culprits that cause flooding, though certainly not the only culprits. Your foundation is under a lot of stress and that stress will eventually cause cracks in basement walls, which allow water to seep in. Additionally, if your lot is poorly graded, it can add to pressure on the foundation and push water flow towards the house. The only way to address this need for water extraction in Alpharetta is to spend significant money rebuilding your home’s foundation. All pipes eventually wear out or break when undue stress is applied to them. Wearing out is caused by oxidation and age. Stress can be caused by frozen pipes, clogs, even tree roots growing through piping. When this happens, if the break is not in the house, it causes water or sewage to pool next to the house and eventually it will make its way inside. 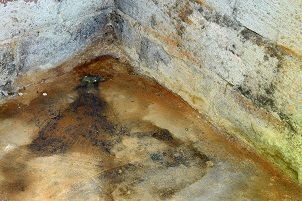 In this case, the water damage repair in Alpharetta could be very significant as the raw sewage and mold health risks are immense. There are a lot of things that hold water in some capacity operating in your basement. Water heaters, water tanks, pumps, filters, even your central air has at least one outlet for water that if damaged can result in a mini-flood. All of that equipment and parts can wear out or break and the result is a flood. For a flood to do damage, remember, you do not need everything underwater, you just need an untreated wet area. This is actually not the most common type of basement flooding although it is the type that gets the most news coverage. A flood that enters into a basement can be the result of groundwater exceeding the water table or something more significant like a river exceeding its banks. Each year, this type of flooding does billions in damage, nation-wide. Basements tend to flood as they are the lowest point in a house and water tends to travel to the lowest point. Monitoring your basement during peak flooding season is one way of staying on top of it, and so is knowing who to call for emergency water removal in Alpharetta at the earliest sign of flooding.